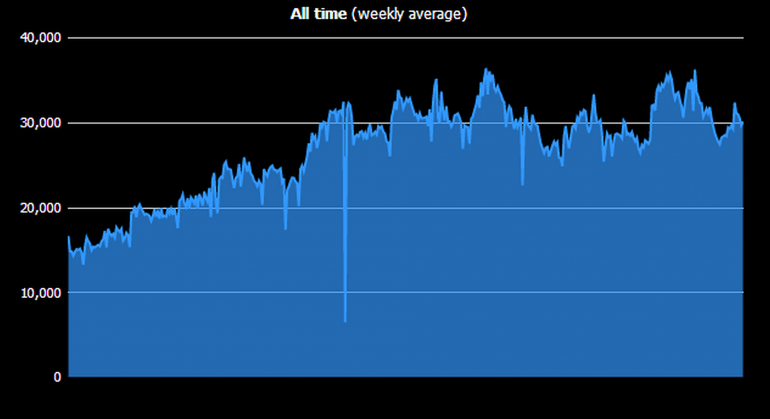 Unsure of what would become of it, I decided to try my hand at the 52nd installment of EVE Blog Banter, and tackle the following graph of concurrent logins to the tranquility server from the perspective of a rather freshly minted capsuleer. You can find the full collection of blog banters here. While I may not have the most experience as an EVE player or blogger, I am a true believer in the wisdom a fresh perspective can bring. Having played a cornucopia of bad online games over the past few years has led me to a pretty firm understanding of what is wrong with the majority of these current games. If I had to tease out a single thread, the fundamental problem would be a seemingly unavoidable story line most of these games seem to follow. That storyline is one where the game slowly travels further and further down the line from crowded servers on release to an eventual loss of interest among veteran players who ultimately quit, and sees the remaining veterans now focused on how to replace lost playerbase by leveraging the game’s existing–and often flawed–infrastructure to support and nurture the repopulation of the game servers. The problem with this all too common quandary seems to be that once you’ve lost it, you can’t get it back easily—“it” being people who actually want to play your game. Many new players have tried and failed to ingratiate themselves to the veteran players who are shouting from the rooftops about “low population woes,” and these same new players have failed to find anything more than a rocky perch they could not hold onto for very long. The majorities of both groups will soon get frustrated and quit. This “population death spiral” forms the basis for most of the economic problems major game producers have faced over the past decade. CCP is different though, and so is EVE. Although it might be hard for some to believe, EVE is the exception to the above rule. The graph above shows us that that is the case, because it has plateaued rather than declining. That is to say that as EVE has seen its veteran player population remain stable or decline, it has conversely seen a sharp uptick in new player interest. This is evidenced in the graph I posted of active subscriptions in this post. I will go so far as to argue that CCP’s design choices actually reflect intentions and willingness on their part to down-regulate the amount of time players spend within the game versus the meta-gaming that goes on outside of it. Skill queues are a good basic example. They demand of the player long term tenacity, which builds subscription base over time, but can also dissuade a player from spending more time within the universe than is necessary ( why play today at Gunnery III, when I could play in a week with Gunnery V? ). In short, skill queues are a simple explanation for how it is possible for EVE to be gaining subscribers, but not increasing total active logins: because mechanistically CCP has allowed the player to advance in absence of being logged in. Clearly this is an intentional design decision, and one that appears to have been quite successful in maintaining a subscription model I might add. My point being, given the success of this mechanism, could we perhaps assume this is a design approach CCP has embraced elsewhere? For myself, I find this to be the case. Manufacturing, Station Trading, and Planetary Interaction are just three examples of highly rewarding activities that require little time spent logged in. One thing that was blatantly obvious to me while writing the above two sections is how different the problems of other games were than EVE, and in conjunction with that, how different solutions needed to be in EVE. So I wanted to start at looking at what those other solutions were. As I mentioned, in other competitor titles a big part of a game’s successfulness is the “stickiness” factor for new and old players. It is frequently reasoned that old players leave due to a lack of end-game content, and new players leave due to a faulty new player experience. Producers and developers have responded in kind by making a large part of their focus and subsequent response center around these two issues. The truth is that EVE is not immune to either of these factors, but it is much more sheltered from them simply because of a design focus that heavily reinforces “sandbox” style gameplay. As far as the new player is concerned, there has never been an easier time in New Eden to simply join the game and start shooting. The opening arc new players are fed through is overly generous. Organizations like Brave Newbies will give you a ship to pilot, a purpose to shoot someone or something, and ultimately encourage getting blown up as an organic part of learning the game. I am going to file all of the above under the important question of why the simultaneous connections graph hasn’t gone down? Truly, I believe part of this analysis needs to look at the glass half full. CCP has actually done a good job keeping the fire stoked over all these years, considering the natural tendency of a game in this category is to lose players over time. The fact that the game has embraced new players, and added them in swaths really shows that CCP is aware of how vital these infusions are. It supports them with generous trials, retailer partnerships, and regular opportunities for discounts. Their referral program is part of the reason EVE has become one of the darlings of the reddit community. So why hasn’t the graph ticked up? I think the simplest answer I can give here is my theory that the “old EVE” is dying at the same rate the “new EVE” is growing. Veteran players don’t really seem to have much new content to show for themselves despite “new and exciting” changes being rolled out. The real end-game content in EVE is gaining and exercising political and monetary influence, and developers can’t due much once that game gets old. They are logging in less because there is less to log in for, but they continue to pay their subscriptions. I mentioned earlier those concretions we can see in game design choices and overarching philosophy. Other evidence of this intentional design can actually be found when you look at how certain “economic ratios” are employed in the game. These ratios are the mathematical variance in price a player observes when he jumps from one tier (ship or module) to the next. You can see that this is already an integral part of how CCP presents choices to risk averse players. Different tiers of ships and their economic discriminators allow the player to systemically modify their exposure to risk at any point in time. The brilliant illusion of EVE is that anything you are willing to work for can be taken away. The same however is also true for your enemies. This can either be a fact that lures people to this game, or makes them run the opposite direction. To use faction warfare as an example though, while we would love to believe in the “anything goes” possibilities it presents, the reality is that faction warfare it is a battlefield full of savvy players who carefully balance their risk vs. reward by primarily flying in groups or using smaller inexpensive ships fit in such a way that they can proactively bail out of an engagement before a loss occurs. There are exceptions, but as far as majorities go, this is where the lines have been drawn. To the uninitiated, EVE is a world where new players are ripe for the picking, and everything a player can earn can be taken. Truly though, New Eden is a world of ship replacement programs. Where “blowing up” is a brave accomplishment even the greenest of newbies can now afford. It’s more likely for a new player to have their dignity taken than to suffer unrecoverable financial destitution. How much dignity does a newbie really have? I don’t believe that the outside world however grasps this concept, and it is precisely the management of this conception in potential players that will determine what direction the line moves next. If it isn’t obvious yet, I think this line can go up—way up. The main challenges to that I see are all what one might call “PR problems.” For starters, I believe if EVE took the approach of merely “injecting new blood” into the existing PVP climate, that line would actually go down. Existing “elite” PVPers that are already playing other games are the most fickle and hardest to attract. It is wrong to think that the most efficient means to expanding the EVE playerbase is to go after the people EVE would or could appeal to anyway. The key is to figuring out how to draw new players into EVE on a superficial level, and get just enough traction there to keep them engaged while the more compelling facets of the universe can grab hold. In other games that “superficial” carrot is PVE, something that simply can’t work in EVE’s favor. For the most part what ultimately resides at the end of the stick for EVE is conflict, but this is where understanding the audience becomes especially important. EVE Online is a product that, to succeed, would need to appeal to a whole generation of gamers who have been indoctrinated into the MMO arena by a decade of ignorance—lackluster cookie-cutter clone games the MMO publishing industry has been shilling since before most young folks can remember. If you exclude EVE, that’s about the length of time since the world has seen a broadly successful full loot nonconsensual pvp title. I mean it quite literally when I say that these folks have a fear of fun. Really it’s a fear of the unknown. If CCP as a company allows their potential customers to see the activity of hauling their goods out of lawless space as an insurmountable non-starter, then a quintessentially fun and novel challenge becomes bad game design in the mind of that customer. The issue is that a near perfect linear relationship between risk and reward IS good game design, and that is the most fundamental design tenet of EVE. It just depends on how you sell it. What this means in EVE terms is that as we travel through the different spheres of CONCORD influence, there are gradients of safety. “Don’t fly what you can’t afford to replace” is the mantra we so frequently repeat because it tugs at our most instinctual sensibility: that anything we have gained can be taken from us anywhere. Sadly, that does not describe an intrepid journey the millions will clamor for. But it also betrays a truth I have come to know all to well. The foolish have the most to fear, certainly, but the shrewd will prosper. EVE is a game where preparation can equal protection. Safety is in and of itself a resource in this universe. It can be bought, sold, and rented. Fear can be obscured tactically with the likes of the aforementioned ship replacement plan. That mantra is our greatest fear, but to the smart player EVE is always a positive sum game. If you are willing to trade your time, you will find a way to make some proportionate ISK return, and do so in spades. It is cultivating a new ideology of hope for fun rather than fear of loss that will drive that line north. I mentioned before the poor player retention that plagues other titles. Perhaps what makes EVE truly unique is the effective two-pronged approach of in game mechanics that compliment the hard work new player organizations like EVE University have already been doing for a long time. If we the players continue to indoctrinate smart pilots into our game, the sky is the limit. Surprisingly, this is not actually a post about hauling or industry. With EVE University no longer under wardec, I have finished up the last bit of training to get into my first T1 battleship. The basic components that had been holding me back were shortcomings in fitting a T2 tank, fitting large guns, and using the right drones. Despite losing some training time to PI, I shored up my weaknesses in each of these areas, and have advanced to ISIS mastery level 2 for both the Maelstrom and the Rokh. Obviously I do not currently have the funds to fit either of these ships, but the past few days have been good to me, and I am actually getting very close. One of my earliest goals in the game has been to fly with one of the beginner friendly incursion communities. Since I don’t really know what to expect, it’s going to be a learning experience to say the least. I am happy to see though that the EVE University has a healthy incursion running community. With any luck, incursions will be a way to replace the ship and fitting costs I will encounter shortly, and then give me the opportunity to set longer term training goals. Though I did not spend much time in the game yesterday aside from resetting my extractors, I hope this weekend will be an opportunity to get some time behind the yolk. I’ve learned enough about what I don’t really like about the game in the past two months, however I haven’t really found my niche when it comes to life outside of the captain’s quarters. So what does this mean for the long haul? Well as I see it currently, I have built up a very broad albeit shallow set of skills. What this has allowed me to do is sample a bit of everything. Now I am getting to the point though where to expand any additional activities is going to require much longer training that ventures deeply into one specific path. It does not help that the two paths I have in mind are opposite polarities of each other. Anyway, I thought I’d expand a bit on what those are. As odd as this may sound, cloaking is one of my favorite activities in space. Barring null-sec and its bubbles, which I know nothing about as a freshman Unista, cloaking is just as fun for me pretty much regardless of where I am. Whether I am hauling around goods, which could eventually lead me down the blockade runner path, or exploring low-sec in a frigate, it’s a nice feeling knowing I’m out there, but the things that go bump in the night can’t get me. With all of that said, I am starting to look at some PVP avenues, and stealth bombing seems like it could be a niche that marries up nicely with my interests. I think I’m going to stick a bookmark here and hopefully come back to it later. For now, that’s as far as I’ve gotten. So here is my problem. This would pretty much the polar opposite of the previous pathway. On the other hand a great source of income, and potentially a way to meet some new players and learn a lot about the game. I am really leaning towards this option as it offers me a lot of opportunity to afford things I’ve wanted to try in the game but haven’t had the ISK for. The major downside to incursions is of course that it may be difficult to contribute properly to the fleets as a newer player, and the fact that it is basically more PVE blowing up red crosses. I am truthfully not a big fan of the PVE in this game. On the other hand, the cooperative element of it may more than make up for it. Have I mentioned the ISK? 3) Try to bank enough ISK to support a multitude of endeavors. 4) Pay my subscription rather than trying to PLEX my account. It is a game after all. I came across this article by Paul Tassi this weekend and had plenty of time to think it over. Overall I agree with his conclusions, and believe he arrived at them justly. I do however think it is such a vast issue that can be attacked from so many angles that there is no single answer as to why a subscription based AAA MMO title can’t succeed in 2014. Actually, I can think of quite a few. 1998 was the first full year two members of our household subscribed to Ultima Online, so I will use it as an example. In the 6 months prior I had already spent $100 or more on the game. I now had my brother playing too though, and his box copy of the game plus both of our subscriptions for the year meant we had spent nearly $300 on MMO titles from a single distributor that year. 2013 is a year I spent a lot more on games than usual, but by no means atypical in terms of online games. When I thought about online games I paid for in 2013 I cobbled together a short list. I remembered all those stinkers I had paid for that still stung a bit…Diablo 3, Guild Wars 2, and the latest FFXI expansion–except the problem is that only the last of that batch came out in 2013. You see as far as MMOs went, I had actually played some pretty terrible ones in both 2012 and 2013. Ragnarok 2 and Anarchy Online to name two of the more pitiful ones from last year. The important thing though was that some hard fought losses in 2012 caused me to be even more cautious with my wallet in 2013. I scoured my carefully organized mint.com account in researching this post, and unfortunately, I didn’t come up with much. This is largely because there wasn’t much there. 2013 wasn’t a compelling year to spend money on something you can literally get for free. Let me caveat that by saying that if the paid games were any better than the free games I might have to eat my hat. But they’re not! As embarrassing of a list of horrifyingly bad games as the above is, I think it does highlight one important factor: there are many people out there like me who are going out and trying to play these games, they are just that bad it’s impossible to even stick with them long enough to want to make a purchase. Path of Exile is a notable game in the list above because it is 100% free-to-play and yet I actually spent money on it. I spent money on it because I wanted to patronize the development team. I only believe that further highlights a problem that has compounded onto itself many times over: if I really like a game I am willing to pay hundreds of dollars if demanded to, but very little if only suggested to. Nearly half of the $85 I spent on online games last year ended up just being expensive mistakes. Only in the case of EVE Online and Path of Exile did I truly believe I had exchanged tender for services rendered. I can promise you that this not insignificant detail is responsible for feeling positive about the customer experience, regardless of what industry we are talking about. The important thing to understand here is that all of the games I didn’t spend any money on have one thing in common. As soon as I realized that my time had been wasted, some knee-jerk mechanism intervened to make sure I didn’t waste my money too. The harsh reality is that the bad games I played in 2013 by and large were anemic in entertainment value, however just as demanding of my time–which is why I gave every single one the axe. 15 years ago it was possible for MMORPGs to demand both a lot of money(relatively) and a lot of time from their players. 10 years ago it was thought to be prudent to demand only customers’ money, but shave down the investment required to “get to the good stuff.” 5 years ago the conventional wisdom was to demand neither, but offer “optional” shortcuts for a nominal price. The difference between the first(Everquest), the second(World of Warcraft), and the third(see my list above) is that the former two strategies are time tested monetization schemes that made the corresponding producers of each game a lot of money. The third has very little to show for itself. I really question when these companies are going to get their act together. I recently participated in two “member’s of the press” weekends with the current version of Wildstar. Their monetization strategy is being called a “hybrid” model. What this means is that you ignore the past 5 years like I mentioned above, and instead you simply copy CCP’s monetization scheme. This move is easily just as clueless as the TESO subscription model Paul Tassi bemoans. The reason is because EVE makes two considerations of the player’s time: 1) That it is precious, yet also finite and 2) That it has some intrinsic value that can collectively be harvested. What I mean by that is that the brilliance of EVE’s monetization strategy is that it is custom tailored around the unique gameplay characteristics of the game itself. For one thing, it is very much a game where time is money, and the players are the content–the world is simply the arena they interact within. Time is what fuels all interactions within the universe, but it is also the only ingredient in this recipe that can’t be skipped. You can buy money in this game, but you can’t buy time. When you pay your subscription to CCP, what you are actually buying is an allotment of time in which you are able to access the game. In that regard CCP is simply a service provider. You are front-loading the cost of a month’s worth of game time which you are not yet in receipt of. But one thing you can never buy directly from CCP is a shortcut to save you that time. Every company that has ever tried to sell both either regretted it, or was just too stupid not to have. In many ways I see that Path of Exile has a similar outlook. Your achievements in the game are really a function of the time you put in–whether that be attending many of the smaller race events, or going in for the long haul. One thing is for certain, it’s not a game where you ever pay your way out of playing. If you are looking for my prediction on what the next 5 years will be like, well I can’t be certain. If anyone with a brain were running the show though, we’d see a player’s time be put at a premium again, and with any luck game companies could go back to selling actual products and services again instead of snake oil. So it will be interesting to see if CCP can get $120 from me in 2014. They’d dwarf what I spent on all online games combined in 2013.